A collection of the latest Supernova volumes to add to your bookshelves. Black Friday weekend: Includes 6 magazines, free shipping and 5 back issues! 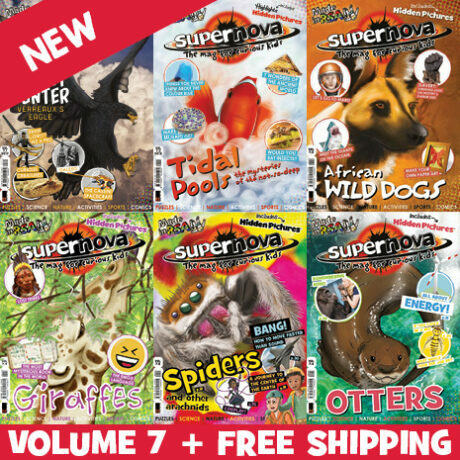 6 magazines and free shipping! Black Eagles, Tidal Pools, African Wild Dogs, Giraffes, Spiders, Otters, and much, much more. Edible insects – should we? Should we contact un-contacted and remote people groups? …and that’s just the stuff we can remember off the top of our heads. There’s so much more to unpack and discover inside a Supernova!